As if it isn’t hard to enough to make ends meet on a modest income in Seattle. A household earning $25,000 in Seattle winds up paying about $4,200 in all the various state and local taxes, according to the report — that’s a staggering 17 percent of its income. But a $250,000-income household pays $11,000, which pencils out to just 4.4 percent of income. That’s a gap of 12.6 percentage points between the tax rates on high- and low-income households, the largest of any of the 15 cities studied. Bellevue, in the No. 2 spot, is only slightly less regressive than Seattle. 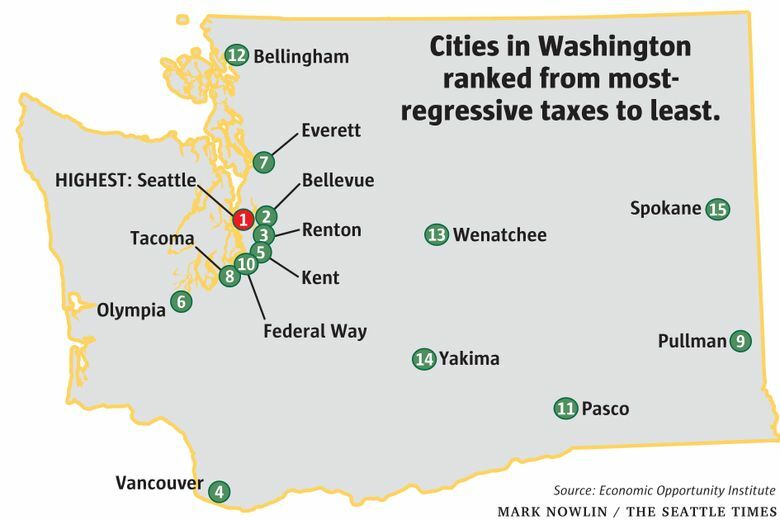 Renton ranks third, giving King County a clean sweep for the top-three regressive cities. Even more embarrassing for us on the “blue” side of the state: The three least-regressive cities are all in Eastern Washington. Spokane tops the list, followed by Yakima and Wenatchee, in that order. While Spokane still taxes the poor at a higher rate than the rich, the gap between those two rates is 7 percentage points, smallest among the 15 cities. Washington is considered a regressive tax state because we rely heavily on sales and excise taxes, which are the same for everyone, rich or poor. And of course, we have no state tax on income. 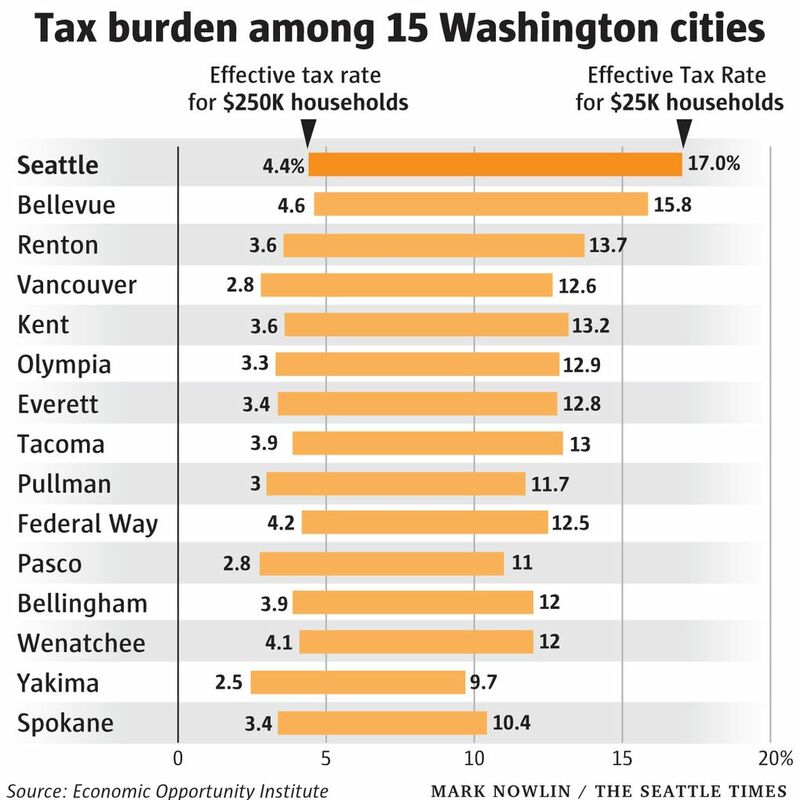 But why are taxes in Seattle harder on the poor than taxes in other areas of the state? A big part of that is property tax, says Caruchet. Even though Seattle has one of the lowest property tax rates among the 15 cities, the home values are so high here that the tax bills are much bigger. That doesn’t just affect homeowners. Renters indirectly pay property tax, too — it’s just folded into the rent. And with rents in Seattle so high, that turns out to be a lot of money. In the report’s methodology, it is assumed that the Seattle household making $25,000 rents a one-bedroom apartment for about $1,390 a month. Of that, nearly $210 — 15 percent of the total rent — goes toward property tax, which adds up to $2,500 over the course of the year. For each city in the report, rents for the $25,000-income households are set at 25 percent below the Zillow market-rate estimates. Even so, some may feel that the $1,390 rent figure for Seattle still seems high for a low-income household. A family or individual living in subsidized housing or a roommate situation could pay less in rent, and therefore less property tax. The $250,000 household is assumed to own its home, which in Seattle is valued at $685,000, with an annual property tax of $6,300. Nearby Bellevue is a bit less regressive than Seattle, due to its lower sales-tax rates, lower car-registration fees and slightly lower rents. Bellevue taxes the high-income household at the highest rate of any of the 15 cities, mainly due to very high property values. Sales taxes take out another big chunk of income for low earners. But Caruchet says that a lot of people falsely believe that sales taxes are fair because rich people spend so much more than poor people. The report assumes that the $25,000-income households spends $824 on sales taxes in a year, while the $250,000-income household spends $2,670. These amounts were calculated using IRS spending assumptions at those income levels. Seattle’s sales taxes are higher than most other cities in the state, another reason the city ranked as the most regressive. In the report, which is based on data and tax rates from 2016, Seattle’s sales tax rate was 9.6 percent. By comparison, Spokane’s sales tax was 8.7 percent. Since then, the sales-tax situation has only gotten worse in Seattle for low earners. The Sound Transit 3 transportation package increased the sales tax to 10.1 percent, and we also have a new tax on sugary soda. But when it comes to raising money, Seattle’s hands are tied because we can’t tax income, Caruchet says. The EOI was a prominent advocate for the Seattle income tax on high earners which former Mayor Ed Murray signed into law last July. The tax was ruled illegal in King County Superior Court in November, and the city has appealed it directly to the State Supreme Court. Income tax in Washington was ruled unconstitutional by the state’s Supreme Court in 1933. Last year, I wrote about a study by the municipal government of Washington, D.C., which compared the tax burdens at different income levels for the largest city in every state. That study found Seattle’s tax system to be among the kindest to the rich, and harshest to the poor, among large U.S. cities.